The Navy’s FUTURE program required a flexible modeling platform for its Manpower, Personnel, Training & Education (MPT&E) needs to test different types of Navy organizational structures and compare them. 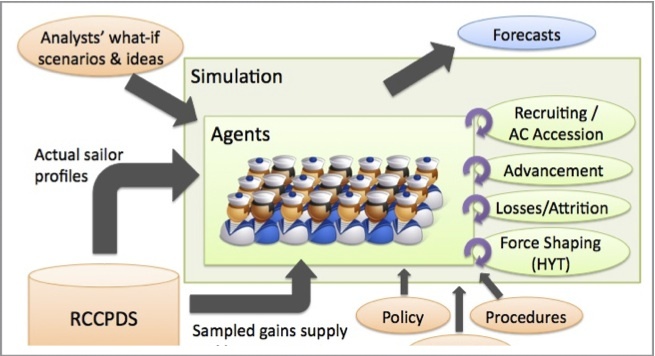 Icosystem developed the Simulation Toolset for Experimental Environment Research (STEER), a simulation environment platform to support MPT&E decision makers. The STEER toolset provides a platform for developing and testing models within the MPT&E domain. STEER is not a specific model but rather an environment that provides a flexible, extensible core that can be customized towards a specific class of end-user domain-centric models. For example, STEER can be used to develop a simulation tool with a highly-customized user interface and analytics/reporting capabilities for Strength Planners or for Community Managers. This allows for successively more powerful models to be developed upon a trusted/tested simulation platform. STEER is based on agent-based modeling (ABM) technology. ABM is based on the principle that it is easier and more accurate to describe the behavior of a system by simulating the individual elements of that system and their interactions rather than trying to derive general laws or models to describe the macroscopic behavior of the system as a whole. ABM takes advantage of the power of today’s computers to simulate in a matter of seconds the behavior of thousands of individuals and their interactions with each other and with their environment. ABM is ideally suited as a simulation paradigm to support Navy MPT&E decision makers. The MPT&E enterprise consists of the recruitment, training, advancement, distribution, separation and reenlistment processes. These are managed by separate functional units that follow complex rules and policies. Even though the flow of sailors through this system is a complicated process, the real complexity is in the extensive heterogeneity that is associated with sailors: the Navy uses more than 100 ratings and more than 200 special skills to describe its needs, and consequently, the qualifications of its sailors. Sailors also possess various aptitudes and demographics, which contribute further to the complexity of the system. Sailor decision-making at various points of the life-cycle is a function of the current state of the sailor, as well as the incentives that are offered by the environment (MPT&E). Most recently the program has shifted in focus towards developing a specific model of ‘Sea Shore Flow’. STEER allows decision makers to predict the impact of changing policies and procedures. With STEER, users can rapidly develop simulations and easily build reports that provide insights into how the organization changes.